Happy October everyone. OCTOBER! That just blows my mind. 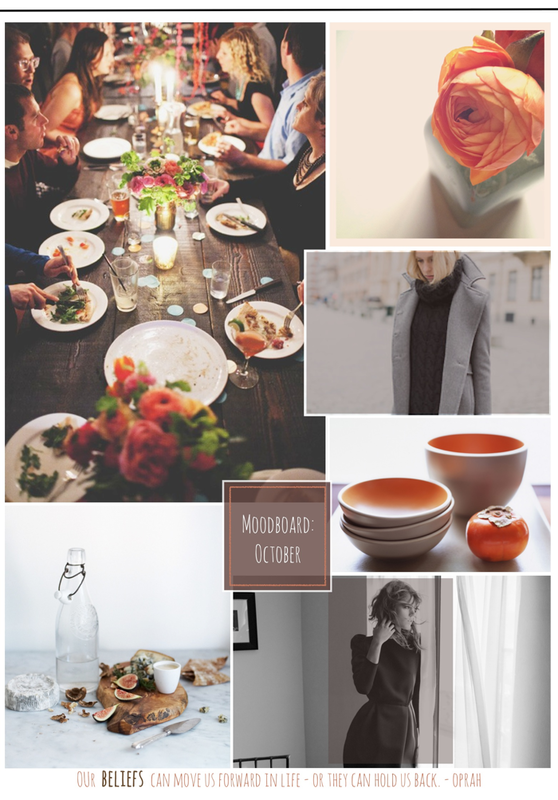 For this month's moodboard, I've got dinner parties (ever since this post), fall colors, fall layers, and quiet, reflective moments on the brain. With the official start of a new season, October seems like a great month to step back and assess the direction of this ship. I've noticed a pattern develop over the last few months where I'll have an idea, do research, gather information, pin images, and fill myself up with tons of inspiration, and then ... no action is taken. The inertia is quite frustrating. I feel like my new motto should be: More doing. Less Talking. I welcome any suggestions/strategies you have. Last month, you may remember that I enrolled in two of Nicole's Classes - Typography and Principles of Good Design. They were taught by Melanie Burk of Fifth and Hazel and Alma Loveland of Ollibird. I wasn't able to be as fully engaged as I wanted in the chats and homework, but I did throw myself into each and every lesson. I learned so much, and both instructors were really great. (I highly recommend.) If you've been following the blog for any length of time, you know that I love graphic design and would love to devote time to properly study the discipline. These two courses definitely satiated that desire, for now. So, the takeaway for this month is to finish the things that I start - My focus needs more focus. Ok, everyone, I'll let you get back to it. Have a wonderful Monday! *I'll reveal your suggestions and the outcome in a later post. First the book. Have you read Rules of Civility by Amor Towles? Loveloveloved it! My dad loved it so much that he started it again immediately after he finished reading it! I need to pull it out again. Now the rest. I am terrible at follow-through myself. Need to work on that. I'm a great idea woman, though! ;) I got distracted with the Firestarter Sessions. Not sure how I feel about that one. What's so appealing about Blog, Inc. do you think? Should I add it to the list? I could use a push. I just hosted book club at my house, too :) Gave me a reason to try a new lasagna recipe and clean a little! pretty colors! i don't have any book suggestions cause... im really awful at keeping up with books i start them but generally never finish... and yes i need to focus more on my focus as well! wishing you a wonderful week - emailing you back now! another good reason to finish the great gatsby is baz luhrmann is making the movie & you so don't want to miss that when it's at the cinemas purely because you haven't finished the book! (though i suspect you have a wee while to wait for its release)... how was the blog book? do you recommend it? Lovely mood board and yes, can you believe it's October already?? Inertia, gosh, I know it well. I can honestly say that up until 5 or 6 years ago I was plagued with it. What I can share is that it's all in our heads, our somehow screwed up belief systems and it just needs a switch.... some people are gifted with the 'just do it' gene. Unfortunately that wasn't me and I had to work hard to re-frame my beliefs!!! In terms of books, there are many but I believe that to get out of inertia we need to 'just do'. For that reason I will come back to a very early recommendation I made. I have talked to you about John Williams': Screw Work, let's play and his 30Days Challenge. Sam has also mentioned it. The great thing about John's methods is that it gets you out of inertia and 'just doing something'. It is the best way to see that everything is possible and re-frame our belief system. Funnily enough, I met John about 5 or so years ago when he first started doing this kind of thing and watched him develop into now writing his second book, which undoubtedly will be equally brilliant! At the same time I managed to finally find that switch I'm talking about and these days am free of the inertia that used to plague me. I'm working on different projects and not all will succeed but that's quite irrelevant. The important part for me was to learn to just do it, without judgement and my crippling perfectionism. Just do it and see where stuff takes me. All I can say it's very liberating and you can do it too!!!! I'm still needing accountability though:)) the learning never ends and that's what makes life beautiful!! I love your moodboard! Such beautiful pictures. For book club, have you read Gone Girl? I read that recently and think you could have some great discussions. Another beautiful moodboard, and if October is going to look like that, then sign me up! I'll take dinner parties and figs and lovely shades of orange. And book club! Go you for hosting it at your house. Hmm, what to read, what to read. I'd really recommend Irene Nemirovsky's Suite Francaise. I think you'd love it. And speaking of love, I love that font you've been using recently! I can't believe it's October already, at this pace Christmas is around the corner. Love the mood board, I definitely feel the pops of orange. Good to hear your enjoyed your classes. Will be taking the BYW Boot Camp this month, hope it will help me to get motivated to work on my blog...Have a great October! Beautiful moodboard and beautiful orange tones. Intertia? Well I have the same strategies as learned from John Williams as Tina has so eloquently put it below. But you are starting the doing by all the research and pinning so I guess it's just working out what it is that's making you get in your own way after this point. When you know what that it is, write it down and verbally tell it off. I don't think there's truly an art to conquering it, but you can get better at learning how to deal with it. I cannot give you a book recommendation since I'm not reading anything at the moment, apart from magazines and glossy design bibles. Last month, I discovered that I was getting stuck a lot too so I went back to an old standby: the Pomodoro Technique. If you're unfamiliar, it can basically be broken down into this -- you work for 25 minutes straight, then take a 5 minute break. Continue the cycle several times, then take a longer break (lunch). It really helps me barrel through my to do list. Also, Nicole over at Making It Lovely just suggested making a life list, which I think inspires great motivation to do. I'll be making one soon. As for books, here are my recent favorites: Unaccustomed Earth (Jhumpa Lahiri), The Marriage Plot (Jeffrey Eugenides), Sleepwalk With Me (Mike Birbiglia), The Elegance of the Hedgehog (Muriel Barbery). The last one takes some time to get into, but then it's just pure loveliness. Looking forward to seeing what you end up choosing! Love this mood board Theresa! Love the fall colors and feel. I'll be heading home to MN this week so can't wait to get a little taste of the crisp air and get away from this awful heat wave! 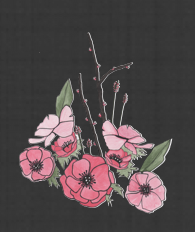 I definitely have Blog Inc. on my must read book and I'm glad to hear you enjoyed it! i totally feel you on having inspiration and then no action is taken. i feel like my good ideas and inspiration come to me when i least expect it; i can't remember it if i don't jot it down. so, i always make sure i take a note of it on my phone (i always have my phone on me) so that i know exactly where to go to when i need to execute it :) hope that helps!! your words are just what i needed to read. 'just do it'! sometimes i get so bogged down with feeling like i have so may things i want to do that i have trouble starting anything.... kinda pathetic, i know. oh honey, i hear you! my partner is a 'just do it' guy; and i like to make lists, think about it, dream about it... etc.my inertia is driving me crazy!! I do recommend Blog Inc. I think it's a great blogging guide and reference to have in your library. I think Blog Inc. is a great book to have in your blogging library. I'm sure I'll be referencing it for as long as I keep blogging. I think Blog Inc. is appealing because it is written by a veteran blogger and business woman, Joy Deangdeelert Cho (who authors the blog, Oh Joy!). It's always interesting to learn from someone who has walked the path before you. Love this comment, Tina! You're the best. Thank you.